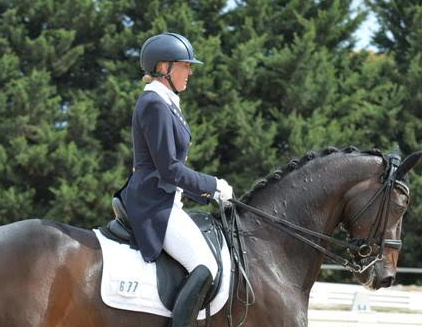 Hailing from Melbourne, Australia, Mary Hanna is a member of the Australian National Dressage team, and recently competed for them at the 2016 Rio Olympics. Rio marked her 5th Olympic Games, having already competed in 1996, 2000, 2004 and 2012. Mary grew up in a family where riding was beyond a hobby, it was a necessity, and she managed to turn her passion into a lifelong career. When did your athletic career begin?Mary has been riding since she was two to three-years-old and that has always been her absolute passion. As a teenager, she was also involved in some long distance running and sport shooting. “I grew up on a farm, so riding was part of everyday life.” Mary’s parents and siblings are also competitive riders, however, Mary was the only one who made it all the way to the worlds biggest stage–the Olympics. A stage Mary competed in on five separate occasions. What adversity have you had to overcome as an athlete?Mary’s athletic journey has not come completely free of adversity. Fifteen years ago, Mary herniated a disc in her back causing her to miss the Beijing Olympics. Mary immediately came up with a plan to get herself back in the saddle, “I started immediately on Pilates and core strength training and was riding again six weeks later. I’m riding better since I learned to maintain core strength.” She worked closely with the Victoria Institute, an organization whose main goal is to assist high level athletes including over thirty Australian Olympians. Mary was always interested in Yoga and her interest was further tweaked when she received a Yoga DVD as a Christmas present. It turned out be a great gift as the combination of Yoga and Pilates has helped her maintain her performance as an older athlete. What does a typical workout week look like?Her workout week generally consists of thirty minutes of Yoga and Pilates a day, swimming three to four times a week for 30 minutes, and of course riding three to four hours a day, six days a week. Mary also golfs one to two times a week. Lorne’s Take – It’s not everyday you get to speak to someone with Mary’s athletic resume. Consistency, focus and passion have obviously played a great role in building such an impressive Olympic resume.